Sam Sachs has been battling racism his entire life. 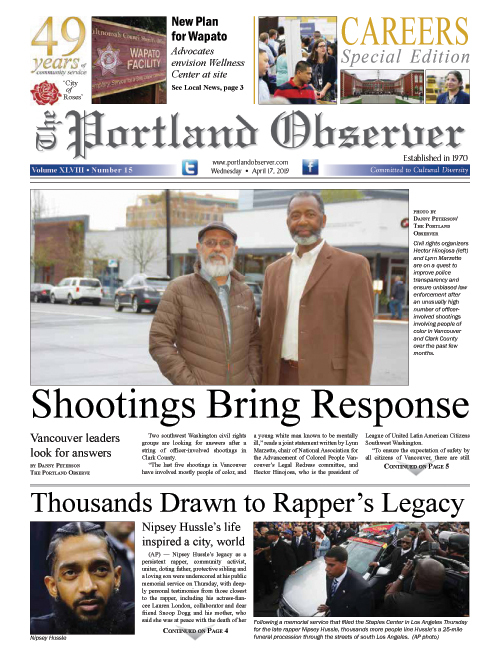 By promoting equity and diversity through his work as a former Army veteran, football player, law enforcement officer, and later as Human Rights Commissioner for the City of Portland, he’s made a name for himself. He’s spearheaded an effort for local and state governments in Oregon to adopt variations of an equitable hiring standard, for example, known as The Rooney Rule, in which at least one ethnic minority must be interviewed for leadership roles. Sachs, who has a bachelor’s degree in Black Studies from Portland State University, was an intern for former state Sen. Avel Gordly, the first African-American woman to be elected to the Oregon State Senate, during her last term in the late 2000s. He’s also helped in the effort to eliminate Native American Mascots in all Oregon K-12 schools. Monthly dinners with members of law enforcement and people of color, aimed at improving community relations, was also initiated by Sachs and Noho Marchesi, Sach’s friend and owner of Noho’s Hawaiian Café at 4627 N.E. Fremont St. Marchesi provides the space and meals free of charge for the dinners. The restaurant dons Sachs’ No Hate Zone decal in its window, a signifier that the restaurant is a safe space for those escaping violence and discrimination from white supremacists and other hate groups. Having grown up as a Jewish kid in a predominately white Christian community at South Albany High School, Sachs said he received his fair share of racial epithets from other kids, who used the Star of David around Sachs’ neck as a target for hate and discrimination in the 1980s. At the time, the school’s mascot was the Rebels and its logo was the Confederate flag. “I would be harassed. And people would call me ‘k-ke’ or ‘h-be’ or a ‘f---ing Jew,’” Sachs, 50, told the Portland Observer. But being a well-built and skilled football player at the school meant when others picked a fight with Sachs, he fought back and usually won, he said. “I make no bones about it, I was a tough guy. And I would beat people up. And I got pretty good at it through junior high/high school, the Army, college, probably until I was 26. I would use violence to respond to racism or anti-Semitism,” Sachs explained. He clarified that the fights were always “mutual combat” and never seriously injured anyone or sent them to the hospital. One night while he was attending and playing football at Western Oregon University in Monmouth, Sachs brawled in what would become a life-changing altercation. Everyone was yelling something during the fight, Sachs said, but he couldn’t understand what they were saying. After the fight, a buddy explained that the people were chanting a rather unflattering nickname, “psycho.” “You’re a psycho when you fight,” the friend told him. Something changed in Sachs when he heard that. “From that day on, I promised myself I would never use violence ever again. And I would never respond. It was an eye opener, it was an ‘aha’ moment, because I was like, ‘they think I’m crazy,’” Sachs recalled.